The Rocky Road quilt block is a simple nine patch using only squares and half square triangle pieces. 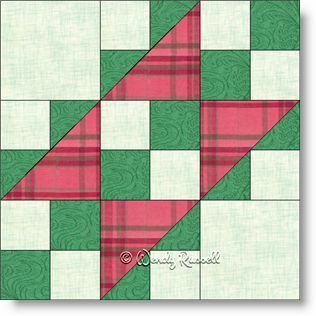 This quilt block can be a learning experience for a new quilter because the half square triangle pieces are not sewn into a square, but are attached to a small square to form a larger triangle, which then attaches to a larger triangle. This is a frequently used technique, and just goes to show that there are many ways to use half square triangles in your quilts. Small four patch "checkerboards" add some additional interest. The obvious directional aspect of the quilt block also leads to using your creativity to come up with different layouts of the blocks. Ninety degree rotations can be used to create any number of interesting quilts. The illustrations below give you two such examples.